Mayardit FM is not only changing the media landscape, it is also transforming people’s lives. Vulnerable populations in South Sudan are very isolated and any kind of information darkness can have a devastating impact. Since South Sudan’s independence in 2011 more than 2.5 million people have been forced to flee their homes due to conflict. The majority of them, almost 1.6 million, are internally displaced and reliant on word of mouth and radio to find out how to access food, water and shelter. Kassimu got the solar-powered radio to start broadcasting in under a month. 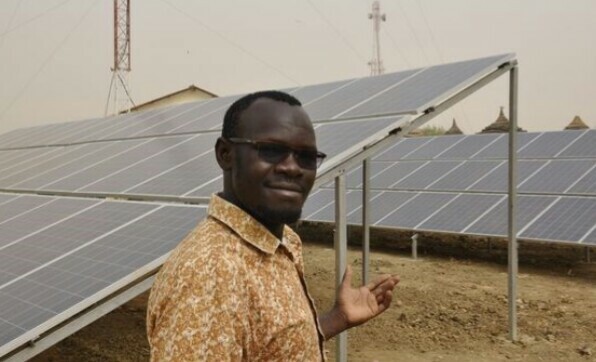 Based in Turalei, in the northeast part of South Sudan, Mayardit FM is fitted with 84 solar panels and 48 batteries and can broadcast for 24 hours using reserve energy built up from sunlight. Kassimu says that so far $172,000 was spent on switching to solar power, but those costs will be covered within five years and will eventually save them money on fuel, equipment and repairs. “We used to spend $22,000 a year just to maintain the generators. In those remote locations, fuel is two to three times more expensive than the cost in Juba, so I thought of something that could at least be sustainable,” he said. While Mayardit FM relies on solar power, most radio stations in South Sudan depend on generators for electricity — because only 1% of the population has access to the country’s electrical grid. These generators regularly break down due to the unstable energy they produce. Kassimu is one of a select few in the country who knows how to repair them. He spends a lot of time travelling, single-handedly fixing generators. Remember, South Sudan is the size of France so there are large distances involved and people often wait for days in information darkness. “Once a generator breaks down, it would take me up to five days to fly to the location and fix it. And the radio would remain off air,” Kassimu says. 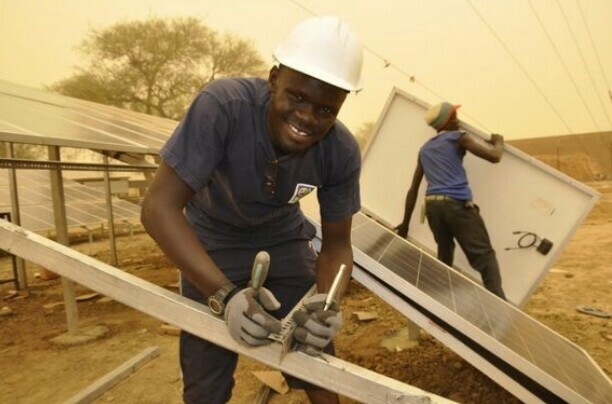 Issa Kassimu and his solar (lightbulb) idea are changing how radio works in South Sudan. For remote parts of South Sudan radio is often the only link to the outside world. Kassimu is part of a network of six local radio stations called the Radio Community which aims to bring radio to the entire country, broadcasting in local languages and reaching up to 2.1 million listeners. Two of the stations are off air because of the volatile situation in those areas. The project is run by Internews, an NGO funded largely by USAID that aims to empower local journalists and develop the capacity of media outlets. 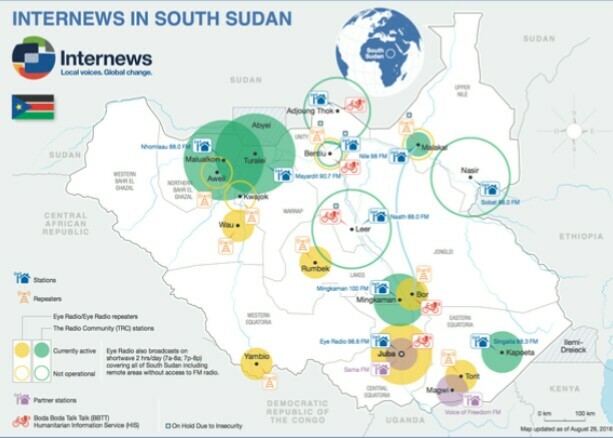 South Sudan is one of Internews’s biggest projects. “The illiteracy rates in South Sudan are incredibly high,” says Steven Lemmy, the Radio Community’s Senior Broadcast Engineer. Adult illiteracy rates are around 30%. “So, if you use one language to broadcast to all the people around the country who speak different dialects, they will not understand. The only thing you can do is bring these standalone radio stations to different, often remote, localities,” he says. Map showing the four functioning Radio Community stations.